Each of the classes are 6 weeks in length. There’s a schedule for the online classes to be taught live (1 hour per week). If you can’t make the live class, there is also a recorded version of a previous live class, which can be watched at any time. The student will have access to all the classes for 1 year. My review will be based on the class we were able to do so far: Math Connections with the Real World. 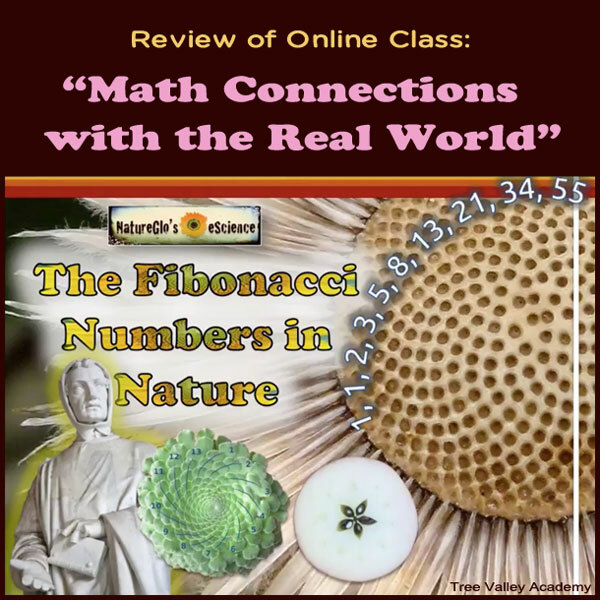 “Math Connections with the Real World” is an online class that teaches its students that math is not just a secluded subject by itself, but is very much connected to nature, music, science, history, literature, architecture, etc. The course explores those connections, and students will see how valuable math is when learning about the world around us. As you can see, learning about Fibonacci Numbers and the Golden Ratio and how we can see this math in our everyday life is a main focus of this course. Before taking this course, I had never heard of these numbers, or at least didn’t remember hearing about them. It was all very new to me. I’m glad to have been able to learn about this type of math. The course is for students 10 and older. In my opinion 10 might still be too young to fully be able to absorb the material as there is math used to explain concepts that isn’t taught till later middle school or even high school. There’s addition, subtraction, multiplication, percents, squaring & cubing numbers, and advanced geometry and algebra that are used in explanations. I love math and was always pretty good at it. It’s been a while since I’ve studied it in school, so have forgotten somethings, but some of the math explanations were a tad complicated to fully follow even for me. However, you don’t need to be able to fully follow all the math to benefit from this course. There’s enough resources and information that can be tailored somewhat to varying levels. For example, while my 7-year-old, I realized very quickly, was much too young to take the course, there were video’s that were simpler and suitable for even her age. So even only watching those video’s, she was able to get a basic understanding of Fibonacci numbers and understands now that plants and nature uses math laws. In my opinion, the course would be ideal for 12 and older. Each week has various learning tools. Usually you can download a study guide. It might include some notes, questions kids can answer while following along with the videos, project ideas, etc. Also you can download a .pdf version of the PowerPoint presentations. Then there is either a live class if you’re available during that time, or you can watch the video’s of a previously recorded class. Usually there are several optional activities that a student could do if they had the ability and interest to do so. There’s also a variety of resources pulled from the web: video’s, activities, things to read, etc. And finally, at the end of each lesson, there is an online flash card based quiz. It’s very similar to match games, where you have to find the 2 cards that match. As I have quite a busy schedule, I used the previously recorded class video’s, so I could watch at my own pace and time. I have mixed feelings about these video’s. As it was mostly just reading the notes together, and circling words and then erasing, I didn’t feel the classes added a lot of value for the time. As many times the material being covered was a bit more difficult, I feel like I would have benefited more from reading the .pdf’s of the slide show myself, attempt to digest the material ahead of time, come up with questions that if answered would help it make more sense to me, and then attend a live class where I could ask the questions. Sometimes when a student that attended the recorded class would ask a question that was answered, I found that helpful. But more often than not it was simply reading and then interacting by circling or drawing some lines and then erasing their work. I downloaded the .pdf’s to check them out, but I didn’t print them out or use them. I can see how the study guides would be beneficial, to help the student actively be engaged instead of just listening. The slide show notes were a little bit more difficult to learn from as it was similar to reading an encyclopedia. I had to really force myself to get through it. It was like exposing yourself to all the information at once, but I didn’t really grasp it well till further along in the lesson. I also didn’t complete the optional activities that were to be done off the computer, but I did enjoy reading up on them and benefited from the photos’ of others that had completed them. My favourite part of the course was the resources pulled from the web. There were such a variety and at such varying levels that this is the area I learned the most from. There were even parts that my daughter could benefit from. You could pick and choose which resources to use. I sampled most of them, but I really enjoyed the variety of video’s. This is where the real value of the course was for me. I also appreciated the online game type quiz. It wasn’t something you had to study for or anything, but was a good learning tool all on its own. Overall I learned a lot and am happy to have gained this knowledge about Fibonacci Numbers and the Golden Ratio. I personally especially enjoyed how math is used in nature and art. I wasn’t such a big fan of the online classes, as I found them a tad dry and challenging to keep my focus in. However, you get what you put into it and with a little extra work on my part I could have benefited more from them. I did thoroughly enjoy and benefit from other components of the course especially the curated web resources. 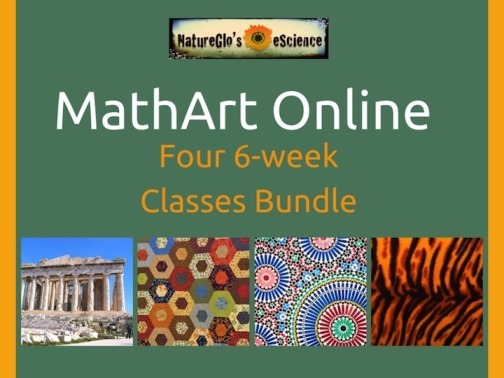 As the bundle contains 4 classes, the next class I am looking forward to taking is “MathArt: Patterns in Nature”.